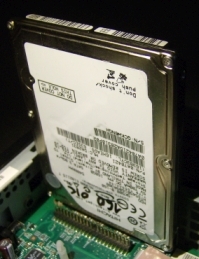 In the pictures one can see the SATA connector, with and without the hard disk. Everything works fine. I was a little worried about the added load that the hard disk would give to the power supply but I didn’t really expect any ptoblem. Now I have to find room for the hard drive inside an already cramped space. I think that probably I will be forced to replace two big 1500u 6.3V capacitors to have enough space to fit the disk and close the thin client. Anyway, the thin client operating system is now Debian, thanking the usb install procedure. I already like the silence. Thank you so much for providing individuals with remarkably superb possiblity to discover important secrets from this website. It really is so kind and packed with fun for me and my office mates to search your website a minimum of thrice in a week to read the latest secrets you have got. And indeed, I’m also at all times astounded with your striking tips you give. Certain two points in this posting are clearly the simplest we have all ever had. Hi, I’m trying to use a boxtv based on the rockchip chipset RK3229 as a thin client, do you think it can work? Maybe. Take a look at http://linux-rockchip.org/ and have fun.